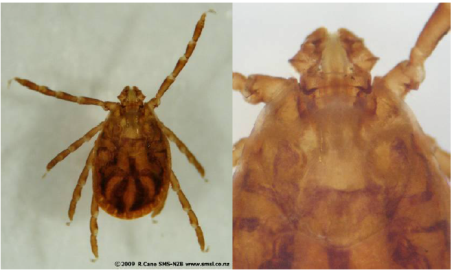 The Longhorned Tick (also known as the Bush tick) (Figure 1) is an exotic tick and has been documented as a serious pest of livestock in Australia and New Zealand. Recently, this tick has been found on animals in New Jersey, Virginia, West Virginia and Arkansas. Longhorned Ticks can be found on multiple animals and is considered a three-host tick. This three-host tick is unique in that it can reproduce either sexually (male and female mating) or through parthenogenesis. The reproductive biology of this tick can lead to large populations occurring in pastures or on animals in a short period of time if left unmonitored. However, since it is a three-host tick, it will typically complete their life cycle in 6-months with all active life stages (larva, nymph, and adult stages) feeding on animals. Host associations for this tick are diverse and can infest both small birds as well as large ruminants such as cattle. Considering hosts and pasture types, these two factors will allow certain areas to be more susceptible to this tick. For instance, this tick does not move very far from available hosts when transitioning between life stages (Heath 2016). Therefore, areas that are regularly visited by cattle with vegetation that allows humidity to stay high such as wooded or tall grass areas are probably more likely to have this tick. This tick is also associated with wildlife such as deer, raccoons and opossums. A common area for ticks to be found in pastures are where these wildlife animals commonly reside such as deer trails. It is also an aggressive biter and causes a lot of stress in animals which can lead to economic impacts to beef animal performance. Disease associations from this tick are important from the veterinary health aspect as well as the public health aspect. This tick has been identified as a competent vector of several bacterial pathogens including anaplasmosis, ehrlichiosis, spotted fever rickettsia, and Lyme disease. This tick is also associated with viruses mainly found in East Asia. However, the most likely pathogen that this tick can transmit is the protozoan pathogen that causes Theileriosis. In fact, the cattle that this tick was sampled from in Virginia tested positive for Theileria orientalis which causes bovine theileriosis which can cause high production losses and high mortality in susceptible beef animals. 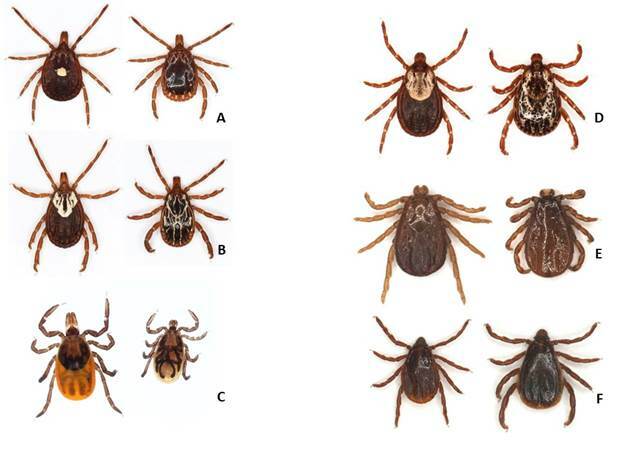 Below is a comparison of ticks commonly found in Oklahoma (Fig. 2).